Edible Rainbow Craft: A Healthy St. Patrick's Day Snack! You are here: Home / Kids Holiday Activities / Edible Rainbow Craft: A Healthy St. Patrick’s Day Snack! 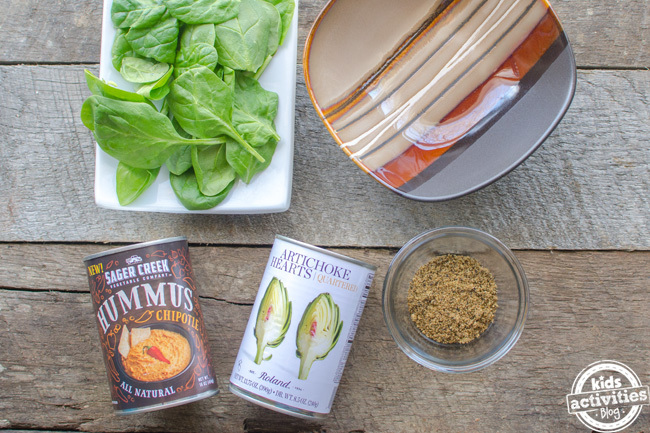 If you’re looking for a colorful and healthy St. Patrick’s Day snack, then look no further! 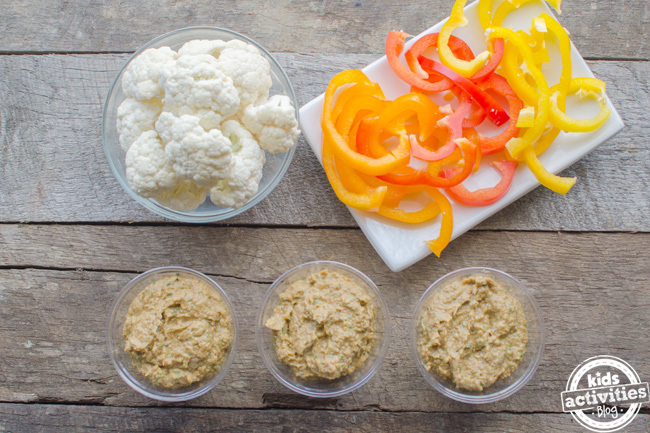 My kids loved helping me create this healthy snack, and they loved eating it even more. 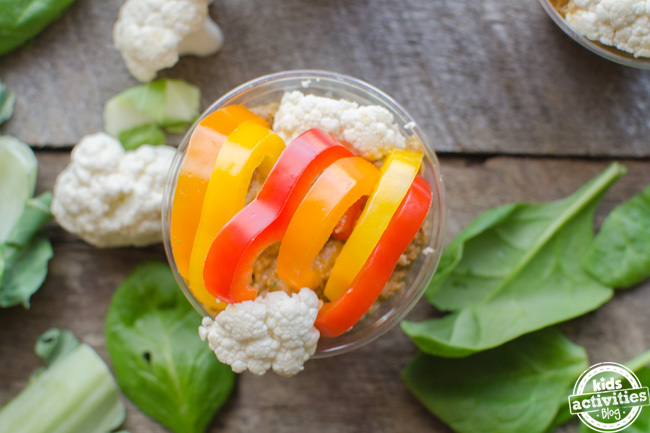 What’s a better springtime snack than your very own edible rainbow? 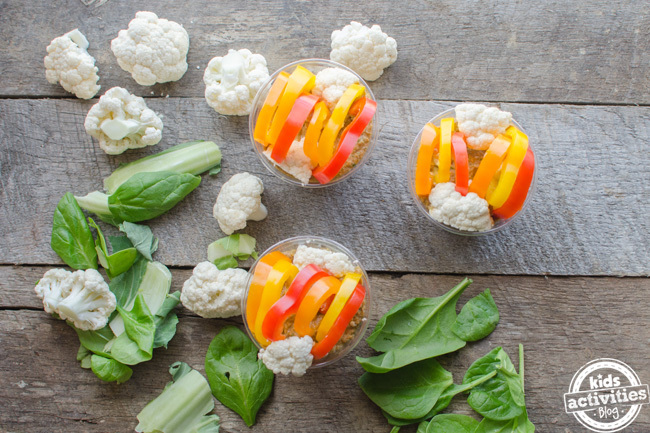 This just might be the perfectly sneaky way to get your kids to eat their veggies! The first thing to come up with was a rainbow arch. I wish I would’ve thought to grab a green bell pepper because I think it would’ve made this healthy snack even more colorful. If your kid doesn’t like peppers, then presenting them in a fun and colorful way might just be the key to get them to try them again. This recipe is super simple to whip up after school, and the hummus can even be made ahead of time. 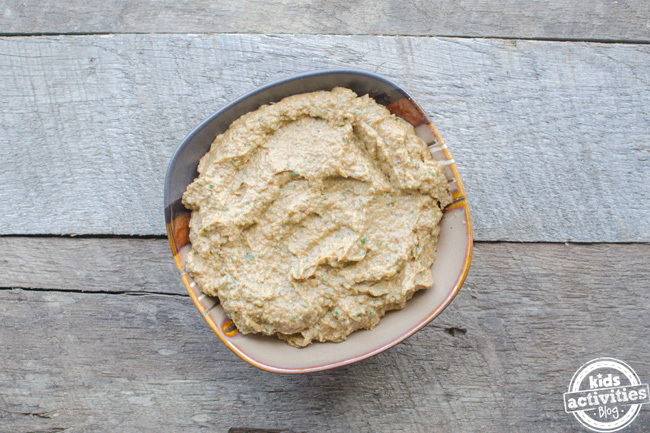 This recipe makes a lot of hummus, so you might want to have your favorite chips ready for dipping! 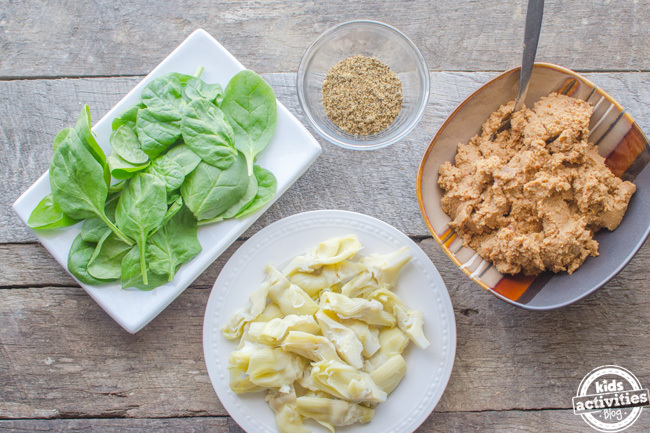 First, in a large bowl using a stick blender, blend together the hummus, drained artichoke hearts, baby spinach, and lemon pepper. You can also use a counter top blender for this part–in fact, your children will probably enjoy pushing the buttons and helping you! Next, using a sharp knife, carefully slice the bell peppers into rings and then cut those rings in half. Then chop the cauliflower into florets. 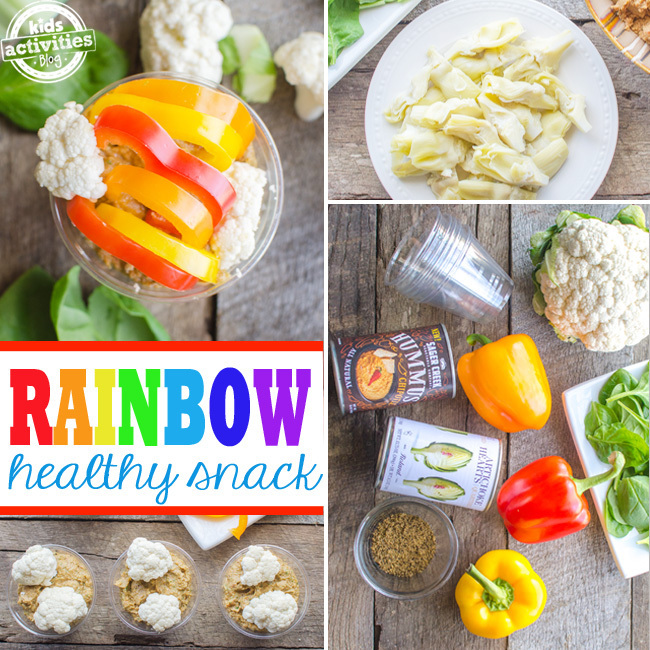 Now it’s time to arrange the rainbows for this healthy St. Patrick’s Day snack! 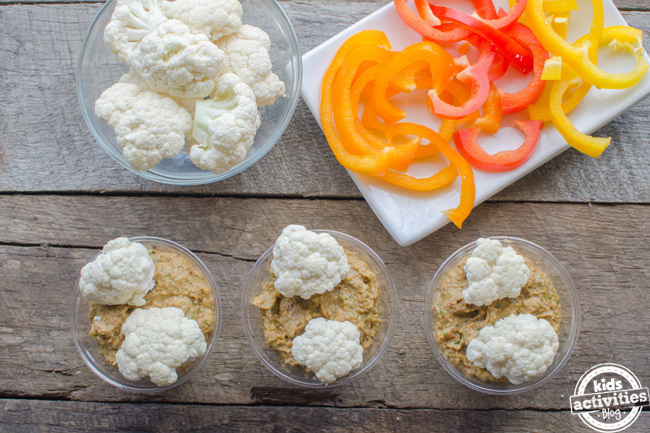 To arrange, just fill small cups with hummus, then take two small cauliflower florets and place on opposite sides of the top of the hummus inside the cup. 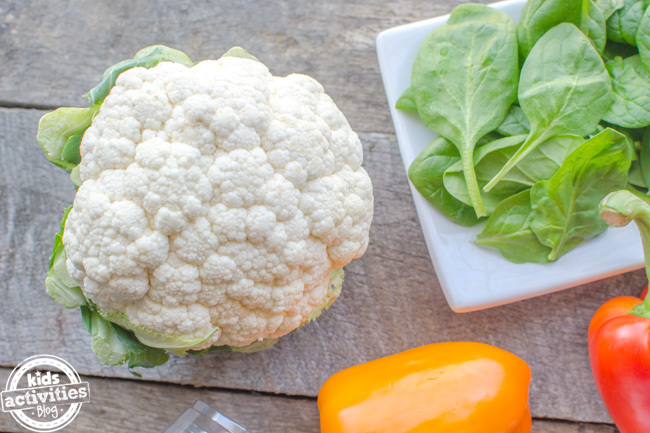 The cauliflower becomes little clouds for the rainbow you’re about to make. To create the rainbow, take the halved bell pepper rings and arrange them in this order: red, orange, yellow, green. 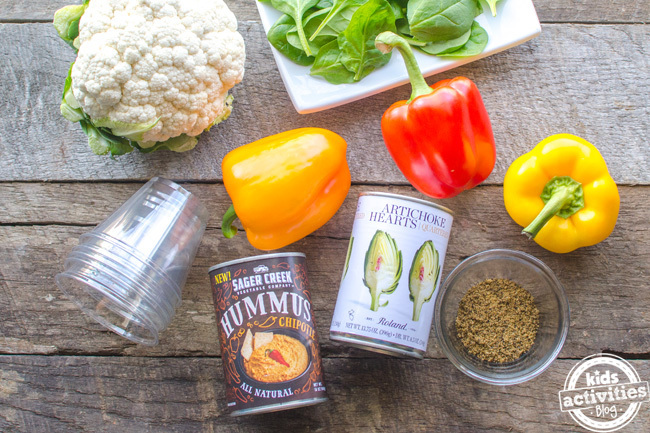 Finally, serve this healthy snack all by itself with a spoon, or give kids a bowl of chips to dip into the hummus after they’re done eating their veggies. 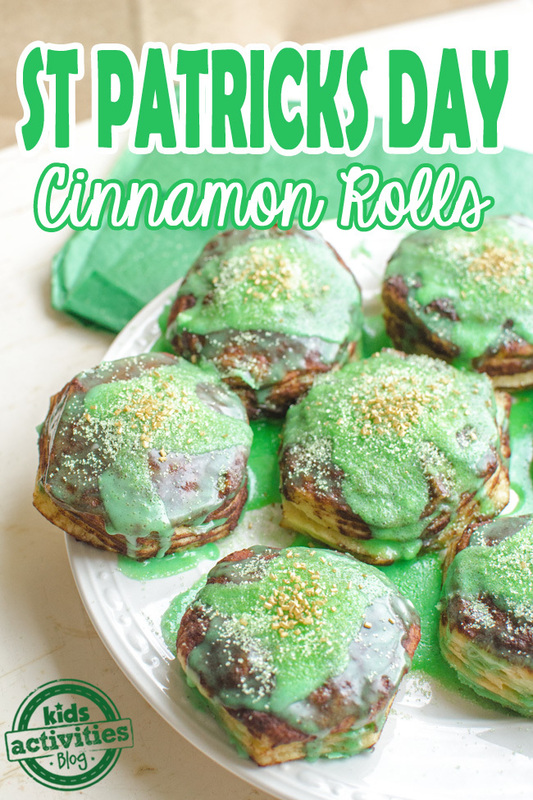 These St. Patrick’s Day cinnamon rolls put a colorful twist on the popular dessert! This Kale and Berry Smoothie is another sneaky St. Patrick’s Day way to get your kids to eat their veggies. Or if you want a big recipe list to draw from, here are 20 yummy St. Patrick’s Day desserts! Leave a comment: Do you have any tips for encouraging your children to enjoy eating healthier foods? I am so hungry by looking at your rainbow! It looks so yummy! I pinned it. It is a great idea!!!! I am so excited about getting to share this healthy snack with your readers. I had to stop over from JDAniel4’s Mom to check out this cute hummus treat! Love it and will need to try this, as well as keep it in my files for our first grandbaby, when she starts eating foods like this! It wasn’t until much later in life that I liked peppers either. He’ll come around eventually. 😉 Very cute idea! this is wonderful, the kids will not think about the veggies they are eating when they eat these. Super cute! I’ve seen a lot of St. Patrick’s Day ideas and rainbow ideas, but this is by far the most creative I’ve come across! Awesome. 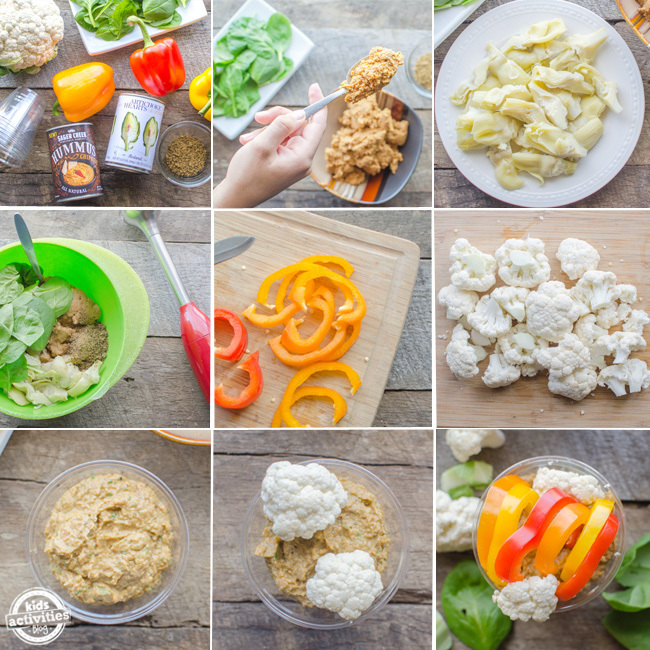 A great way to get kids to eat cauliflower. That looks awesome! LOVE the whole thing. My boys aren’t huge on peppers but I try them once in a while anyway thinking they might eventually like them. I love the cauliflower clouds, that is super inspired. What a fantastic idea! I’m definitely going to save this recipe! Thank you for sharing! I love this snack! So clever and original. I think it’s great that you presented the peppers anyway. Every now and then it works around here. Thanks so much for sharing at AfterSchool, so nice to have you! LOVE THIS! So adorable, I’ll definitely be making it for my kiddos. Have you tried the sweet bells from Costco? They come in a bag, and they average about 2 inches in size. My kids love those, but don’t like regular bell peppers. Perhaps your son would like them as well. This is HILARIOUS! I love love love it! BRILLIANT! I love this, and plan to adapt it for the centerpiece for my Shamrock Tea. Instead of individual servings, I’ll make it a little larger, and if people want to they can use the dip for the fresh veggies I’ll also be serving. For kids, this would be very cute served in an ice cream cone, which they could also eat. Hi, Stopping by to let you know I featured this for St. Patrick's Day! Thanks for linking up! I featured this post at our AfterSchool party this week! Such great snack. Such a clever and fun way to get kids to eat a healthy snack. I love your creativity. Hi. Just wanted to let you know that I’m sharing this wonderful recipe on a roundup later today. Israelis lehnen sich gegen ihhre rencontre seexe orleans Regierung auf archiv/wp-includes/locale.